I thought I would combine nights #3 and #4 since each night is gradually becoming less and less eventful. Just to summarize, night #2 of 'Crying It Out' was a significant improvement over night #1, especially with the night awakening. Night #3 was also an improvement in comparison to night #2. 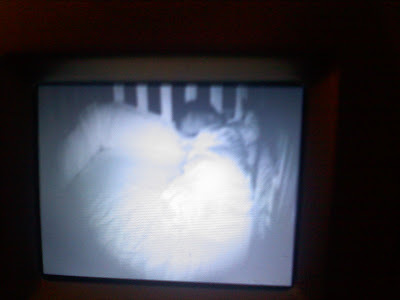 We started Jillian's bed time routine at 7:45pm, the same as we had the past two nights. I was a little nervous for night #3 because I had to put her to sleep myself. Jeff has hockey on Wednesday nights so he had to leave right after bath time. I fed Jillian a bottle, read her a book, and them promptly put her to sleep at 8:30pm. She cried for about fifteen minutes and then finally fell asleep. I noticed that she didn't try to watch for us by the door as much as she had the past two nights. She seemed to be laying down more a lot more that night. There were no tantrums and no hysterical cries. Thankfully Jillian had pity on her Mommy she didn't wake up the rest of the time that Jeff was at hockey. I was actually able to enjoy a little HGTV and caught up on some blogging. It was a great evening spent alone having some "Mommy" time. That night, Jillian woke up promptly at 1:30am and only cried for a half hour. Jeff didn't even have to go into her room for a visit, a lot of her crying was mostly some fussing along with a lot of tossing and turning. She then finally fell back asleep. The night awakenings is where we are seeing the biggest improvement. What a difference from being awake on and off for over three straight hours on night #1 to only thirty minutes of crying by night #3. I noticed that my body was still getting up a few times a night as it did these past few months. I too need to train myself to go back to sleep and stay asleep. It seems like I wake up a lot at night just because I too am conditioned. Jeff was back home for night #4 and it was his turn to give Jillian a bottle and read her a book. She fell asleep again after 15 minutes of crying. I still felt horrible even after fours days of this but her constant improvement each night kept us going. After Jeff put her to bed, we resumed our positions on the couch as we had each night and tried to distract ourselves by watching our recorded shows on the DVR. I can't say enough how having Jeff there with me really did make such a difference. Jillian's night awakening on night #4 was at 12:35am. An hour earlier than her usual wake up time. Her crying only lasted 15 minutes and I felt that I wasn't as wide awake myself for it as I had been the last four nights. When I woke up the next morning, I recalled waking up and watching her for a few minutes on the monitor but never fully woke up. Perhaps my own schedule was starting to turn itself around and I was getting used to better sleep. I received a question in my Night #2 post asking me if I would have done this sooner if given the chance. My answer is yes. I know 'Crying It Out' is usually recommended in most sleep books around six months, however, I know so many Moms who have successfully tried it sooner. A lot of my co-workers and working friends, including my sister, have tried it around four months, which is around the time that a typical maternity leave is over with. They decided to try it so they could get more sleep when returning back to work. Jillian was never a good sleeper, she didn't start sleeping through the night until eight months. It seemed like as soon as she did finally start to consistently sleep through the night, her ear infections started to interfere with any progress that we made. Jillian also would not go to sleep at bedtime without falling asleep to a bottle. If she didn't fall asleep after her bed time bottle, it was a constant struggle of both Jeff and I taking turns trying to get her to sleep. If we put her in her crib even remotely awake, she would cry in protest. We either had to rock her or walk around with her for 30-60 minutes each night. Naps were also a struggle for us too. She wouldn't nap in her crib until finally around four months and when she did, I would have to find a way to get her to sleep before I laid her down. There was a brief period where I was able to "trick" Jillian into taking a nap by putting her in her crib with a few toys and she would eventually lay down and fall asleep, however, once her ear infection troubles started, she would ONLY go down for a nap with me holding her. On day #5 of crying it out, I decided to let Jillian cry it out with naps too. I will get more into that in my Night #5 post. Looking back, I would have loved to have started 'Cry It Out' around six months. Babies around six months no longer need to get up at night to feed, they are getting their necessary nutrition during the day. Night awakenings after six months are now more out of habit than a nutritional necessity. Now that Jillian is ten months, she is old enough to throw tantrums and angrily throw herself around in her crib. She also now sits up and kneels in her crib. I think seeing her react the way she did by constantly sitting up and kneeling along the railings and crying just stressed us out more. We were afraid she was going to hurt herself! At least at six months, she wasn't sitting and would only have been able to roll around in a laying position. Now that we have been through this, if we are having any kind of sleep troubles with our next baby, he or she will have to go through it a lot earlier than Jillian did. Thank you for all of your questions and supportive comments! It sounds like so many of you have also dealt with sleep issues with your babies. I know 'Crying It Out' isn't for everybody, but I am glad that I am able to share our experience. We are not out of the woods yet but we are certainly enjoying more sleep at our house!!!! We trained both of our boys that way too! We started early (once they slept through the night, usually about 2-3 months) and have never had a problem. With Thompson, I did the whole "rocking him to sleep then laying him down" and figured out fast I couldn't do that. So I quickly started the "drowsy lay down". With Brycen, we haven't had a problem. (Only when he had an ear infection!) I am so glad she is doing well with it. I have been thinking about her lately. Keep up the good work, Jillian! Keep on keepin' on. Sleep is a precious gift when you have little ones - for you and for them! Looks like you're doing a great job, I am definitely keeping this dog eared for when my newest addition arrives! Karen, thank you so much for doing this post series! I would have KILLED for this encouraging information when we were doing CIO with Ellie. I totally agree...these posts are going to be so important for so many mommas. I am one that did try it sooner...around 4 months to be more specific! Gillian Grace was just ready and it took about 4 nights before she was good to go. It is so amazing how quality of life improves for everyone once they learn to self soothe and put themselves back to sleep. Now GG can self soothe during naptime or bedtime...it's a wonderful thing! Just caught up on your posts Karen! I am happy to see that the CIO is working... I know it's hard, but in a few weeks you will be SO HAPPY, and so will Jillian! Every night I go in to check on Brooke I remember how many nights I was up with her and now how she NEVER wakes up just amazes me... I do believe it really does take that training with a lot of kids. If you talk to parents who never did it, their kids are still up at night and they are 3, 4, and 5! And then it's even harder, so you are doing the right thing!! Remember my story about Jeff turning off the monitor the first night?! OMG... glad it's only getting easier! !